Have questions? Want more information? Need help filling out a form? Call, email or visit us! Please contact us directly at 1-800-230-5570 to learn more about MLN Brokerage Services. Please fill out the following form and one of our representatives will follow up with you with more details. I would like to receive email offers and information from MLN Brokerage Services. The following questions are optional. Which stock/option advisory service do you follow? Which investment seminars have you recently attended? What brokerage firm do you currently trade with? We’re ready to help you open your account. Just call 1-800-230-5570 or open an account online. Some traders prefer the online trading experience; some prefer the customized solutions of a full service broker. MLN Brokerage Services bridges the gap between these two preferences by offering a top rated online trading system and a very special brand of personal guidance and service. Securities offered through: AOS, Inc. doing business as TradingBlock and MoneyBlock, Member FINRA SIPC NFA BrokerCheck. A Registered Investment Adviser. Corporate Office: 311 S. Wacker Dr. Ste. 650 Chicago, Illinois 60606 www.moneyblock.com 800.591.8243. Investing and trading may result in loss of capital. Options and single stock futures involve substantial risk and are not suitable for all investors. 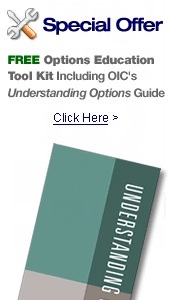 Please read Characteristics and Risks of Standardized Options prior to investing. Please read Risk Disclosure for Security Futures Contracts prior to investing in Single Stock Futures. Market volatility, volume and system availability may delay account access and trade execution. Day trading is a high risk, speculative trading strategy and is not suitable for all investors. For more information on risks associated with day trading please read Day Trading Risk Disclosure. All content, tools and calculations provided herein are for educational and informational purposes only. For more information, please review our Online Services Agreement. Products and services are intended for U.S. residents, and may not be available or offered in certain foreign jurisdictions. You are fully responsible for any investment decision you make. MoneyBlock makes no investment recommendations and does not provide financial, tax or legal advice. * MoneyBlock earned four out of five stars for "Range of Offerings" in Barron's "The Best Online-Brokers of 2014" by Theresa W. Carey. Published March 17, 2014. Barron's is a trademark of Dow Jones & Company. © 2015.